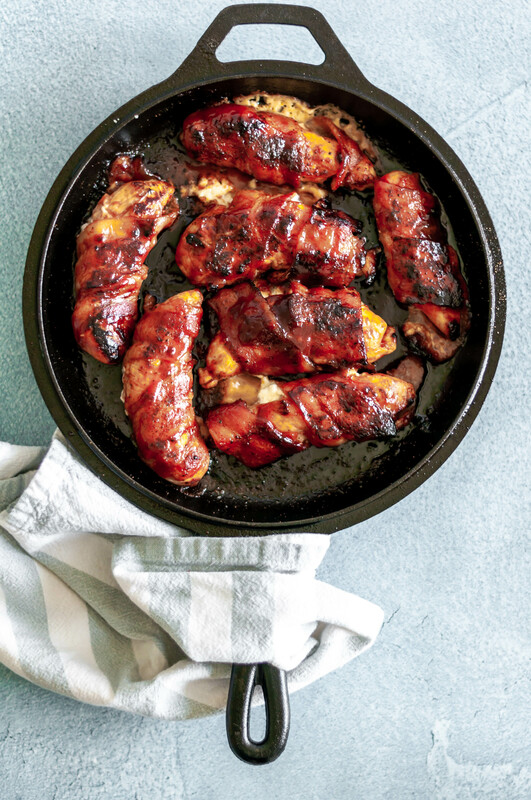 BBQ Bacon Wrapped Chicken Stuffed with Cream Cheese is the ultimate dinner, appetizer or game day nosh. What’s not to love?! *This post contains an affiliate link. For more information, click here. They are all easily accessible and common ingredients but friends, this recipe is anything but ordinary. These bacon wrapped nuggets of goodness are super indulgent but you can find the ingredients at ANY grocery store you walk into. These kind of recipes are what my blog is all about and I love sharing them with you. I love this recipe even more because of its versatility. They are a great option for an appetizer at a party or on game day. Or you can make them for a fun dinner. They aren’t difficult to make but may take a little more time than you have on a busy weeknight. No worries because you can prep them ahead of time (stuff with cream cheese and wrap in bacon) so all you have to do is cook them when dinner time rolls around. When something is stuffed with cheese and wrapped in bacon, you find a way to make it happen. Am I right?! The cream cheese gets all melty and gooey. The bacon crisps up. The super simple, homemade rub brings some sweet and spicy heat and adds some additional caramelization. And the barbecue makes it saucy. We start this bacon wrapped chicken by cutting a slit in each chicken tenderloin then spreading it with a tablespoon of cream cheese. Then the chicken gets brushed with barbecue sauce and wrapped in bacon. A light sprinkle of the barbecue rub and you’re ready to cook. I love using a cast iron skillet when cooking this chicken but if you don’t have one an oven safe skillet will do the trick. After the bacon is crisped up the chicken finishes cooking in the oven to crispy, tender, sweet, spicy, gooey perfection. Your next game day is going to need this. BBQ Bacon Wrapped Chicken smothered in barbecue sauce and stuffed with cream cheese makes the ultimate, flavorful dinner. Simple and delicious. Mix together spice rub ingredients in a small bowl. Set aside. Preheat oven to 425 degrees F.
Cut a small slit lengthwise along the chicken, making sure not to cut all the way through. Stuff each piece of chicken with 1 tablespoon of softened cream cheese. Brush the chicken lightly with barbecue sauce. You won't use all the barbecue sauce at this point. Preheat a cast iron skillet (or other oven safe skillet) over medium heat. Wrap each piece of chicken with a strip of bacon and sprinkle evenly with the spice rub. Place seam side down in the preheated skillet. Cook chicken until the bacon is browned then flip and cook the other side until browned and crisp. The chicken will not be cooked through at this point. Brush the chicken with the remaining barbecue sauce. Place the skillet in the preheat oven and bake for 12-15 minutes, until cooked through.